Just a few weeks left to go!! This week has been about the same, just a couple new things have popped up symptom wise. I’ve been waking in the night consistently around 1am to go pee. It’s super annoying because I usually wake around then with my insomnia, but now I have to get myself up to go to the bathroom and wind up being too awake to crawl in bed and just go to sleep. I forgot to mention in my last bumpdate but I’m sure that I’ve got the beginnings of hemorrhoids – boo. I’ve also been having looser stools than normal – sorry, probably should’ve warned you. My Braxton hicks are still pretty frequent but I’ve noticed, mostly in the evenings, that I’ve been having some pretty strong contractions. I feel a lot of pressure in my pelvis and cervix. They are definitely stronger than my usual BH. I’ve been losing pretty consistent amounts of my mucus plug the past three days which is exciting (or gross, whatever). I’ve lost maybe 1/2 -3/4 of a tablespoon. It’s not bloody or tinged yet. I had my appointment today for my strep screen and my doctor checked my cervix while I was there. He said I’m between 1-2cm dilated. He didn’t have to reach too far up so I wonder if baby girl is low. He didn’t say a station or effacement, but I have a feeling that with his ease of finding it, it’s pretty low. Baby girl is moving around regularly still, though she’s getting more and more cramped for space. I find it hard to tell which way she is in there. It’s so odd to me because with both of the boys, I could tell you exactly where they were. She gets hiccups a lot but she isn’t really too upset by them. I keep thinking – only two more weeks until term. I am getting more and more anxious as the days go by! 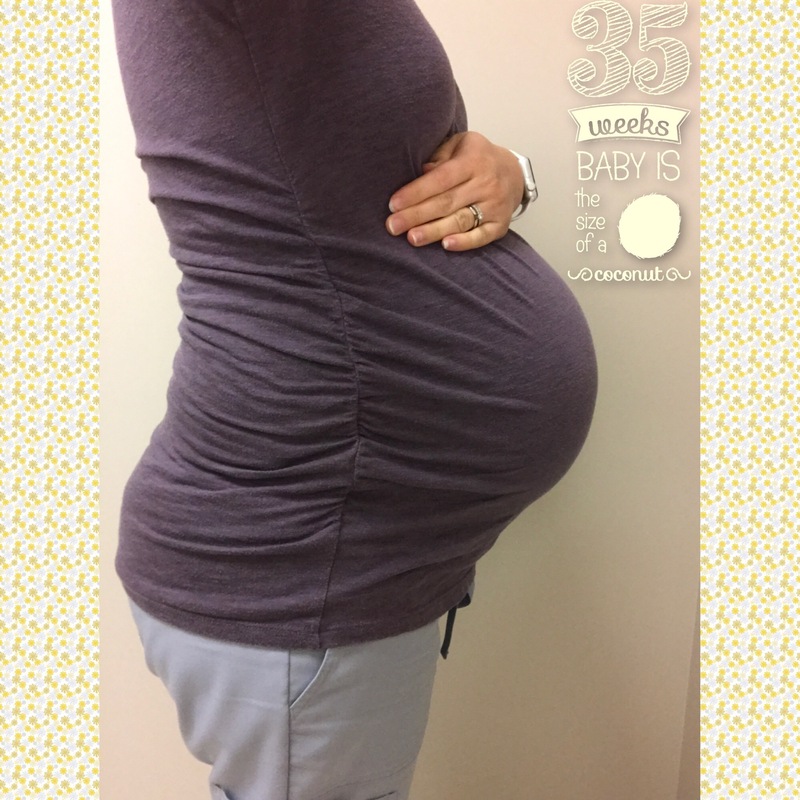 This entry was posted in Family in the making and tagged 35 weeks pregnant, baby, bumpdate, pregnancy, pregnancy update, pregnant, prego. Bookmark the permalink.